The best thing about the web is that it can quickly give you the answer to that perpetual question: what do I do with this? Well, we had also bought some corn and cucumbers, so I was delighted to discover this recipe from marthastewart.com. Originally presented in Martha Stewart Living in May 2008, this is a fabulous recipe. It’s gorgeous to behold and most yummy from the first bite to the last. It’s healthy, colorful, and an excellent complement to the other dishes on your table. Pairing this with roasted chicken or a barbequed steak is a total winner. The salad is happy whether you serve beer or wine. Or both. Make the vinaigrette: Preheat oven to 350 degrees. Drizzle garlic with 1 teaspoon oil. Wrap in parchment, then in foil. Bake until soft, about 30 minutes. Squeeze garlic from skins. Mash until smooth. Whisk together the remaining ingredients with 1 tablespoon of the roasted garlic and remaining 2 teaspoons oil. Make the salad: Prepare an ice-water bath. Cook beans in a large pot of boiling water for 2 minutes. Using a slotted spoon, transfer beans to ice-water bath. Let cool completely and remove with the slotted spoon. Cook corn in same pot for 1 minute and drain in a colander. Peel thin shells off beans. 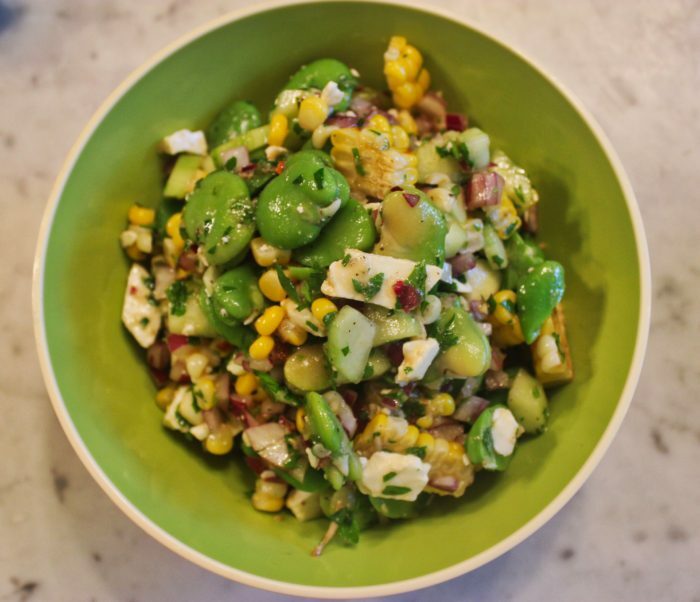 Toss cucumber, onion, parsley, feta, beans, and corn with the vinaigrette.